In their book on managing the symptoms of dementia, Ballard et al. 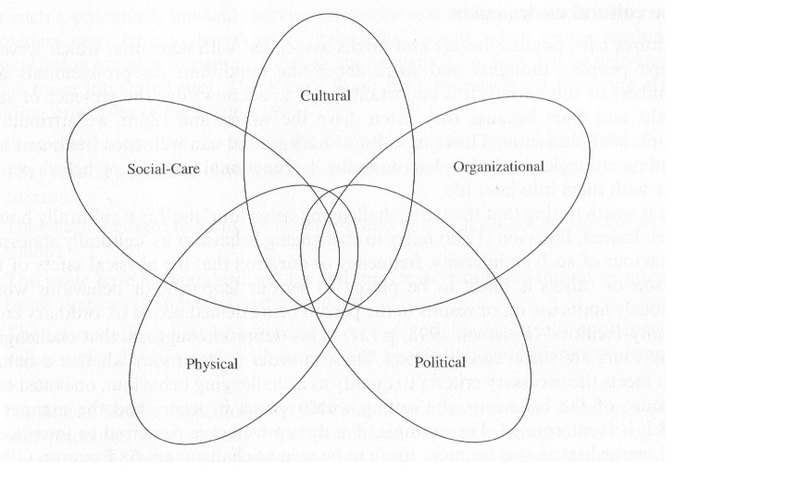 (2001, 93), included this schematic to illustrate the ways that the different environments affect people with dementia. They pointed out how the physical environment can affect the well-being of people with dementia: “large, high-ceilinged rooms can distort speech and distance perception; small rooms often lead to a sense of enclosure and anxiety; uniformity of appearance sometimes promotes aimless wandering and disorientation” (ibid, 95). In a couple of recent events staff who work with people with dementia have commented on the positive changes in the changes in patient’s behaviour when taken out of the care environment. During my chat with members of Beamish’s Older Peoples’ Advisory Group, the carers commented on how striking it was that patients’ behaviour improved when they were taken out into natural environments and how this was contrary to the carers’ expectations of difficult behaviour. Simiarly, during a recent presentation about a series of creative workshops in a museum/heritage space the presenter commented on the marked change in participants’ behaviour when they arrived at the venue. I suspect that part of the impact will be due to the way that the change in location and activity influences the carers’ behaviour towards their patients. (This perhaps points to the need to take a narrative approach to understanding reminiscence, i.e. to consider the ‘story’ of a group’s day and the place of the workshop within it.) However, part of the effect seems to be linked to the space itself. I’ve just started reading Bill Hillier’s book ‘Space is the Machine’, which is a presentation of a particular analytical, architectural theory of space that he and his colleagues developed. In the introductory section he mentioned work that a colleague of his had done on ‘spatial cognition’. I need to pursue this idea somewhat but the idea that we intuitively engage with and respond to the spaces we find ourselves in would be quite helpful. (By ‘intuitively’, I’m assuming some sort of pre-conscious perception and cognition.) But I need to find out what is known about the mechanisms of spatial cognition before we can see how this intersects with the pathology of dementia. Nonetheless, if this could be done, it would help to further tease apart the elements of an object-handling / reminiscence session in settings other than care institutions and perhaps help us understand those anecdotal observations made by carers and workshop leaders. This entry was posted in dementia, museums, object handling. Bookmark the permalink.